the photograph was taken in Paris, France. excellent angle and the color is fabulous! This photograph feels so... voyeuristic. to bad its not perfectly symmetrical. hah byłam tam jeśli chcesz zerknij na moją galerię i tam też są zdjęcia z Paryża. Pozdrawiam. Amazing the position, making the eiffel tower imponent over everything scratching the skies! Ooh... Eifel tower... I just dream of going to Europe to take such a beautiful picture of it like yours. I love the perspective, and the sky behind it looks so amazing! Stunning! 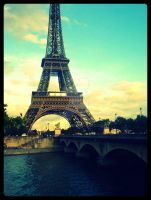 man, its one of my dreams to visit Paris, awesome picture. Nice work!!! I like it very much!!!! I was just in Paris a couple of months ago, brings back good memories! How anyone could see this picture and not add it to their favorites is beyond me. The positioning of the shot makes this so classy and professional. Wonderful work. makes the eiffel tower look like a dreadnaught or harbinger of storms. crazy. Holy Hell! This is a beautiful shot. Really caught my eye. Never seen a shot of the Eiffel Tower from this kind of perspective. I love it! I love the way how the perspective and background in the shot makes it look even more imponent. everyone has to take a photo of Eiffel tower, it's classical. but we never get rid of, especially yours. Wow! Amazing! I really love this picture!